Needless to say I took a sample to examine the binaries and the first file I examined was 1905213386987886907.exe. The file was compressed using Mystic Compressor. 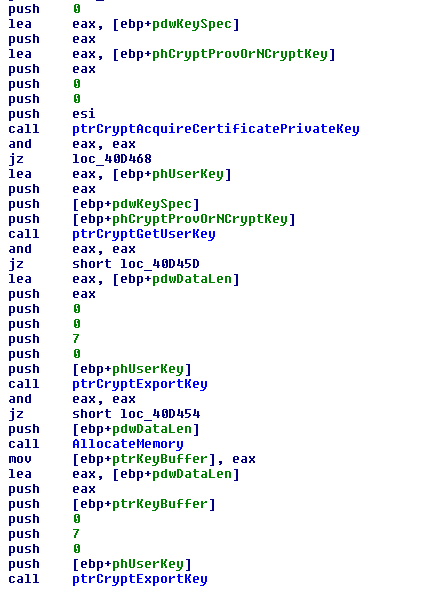 I unpacked the file manually and started to examine the unpacked PE with IDA freeware and here is what I found. The sample harvests passwords from all common and some not so common software like ssh-clients, ftp-clients, email-clients and webbrowsers. It also tries to collect certificates with OID 2.5.29.37 which are usable for code-signing, and client- and server-authentication and tries to export their private keys from windows certificate store. The sample also contains a list of passwords possibly already harvested from other victims. The password list is used to try to logon as other users in Windows Terminal Server and Active Directory environments and also harvest their passwords and certificates. The collected data is then sent to a server using a POST-request to hxxp://115.47.49.181/xSZ64Wiax/ojXVZBxRQVfp6gAUziCGnB8V7Aikbs0Z.php. I did not take a too close look into the sample, just the parts that immediatly caught my eye. When you caught this one there’s a really high chance that all your credentials (passwords and certificates) are gone and need to be changed asap. I will examine the other samples in the next days to check out what they’re up to. Posted by lsmooth on 2013/09/29 at 9:15 PM under Malware Analysis.